This new version adds 2 standoff holes as well as an extra decoupling capacitor. 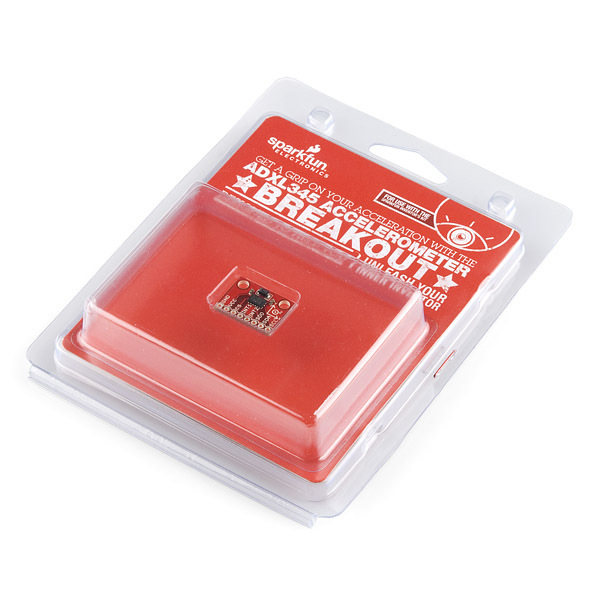 Breakout board for the Analog Device ADXL345. 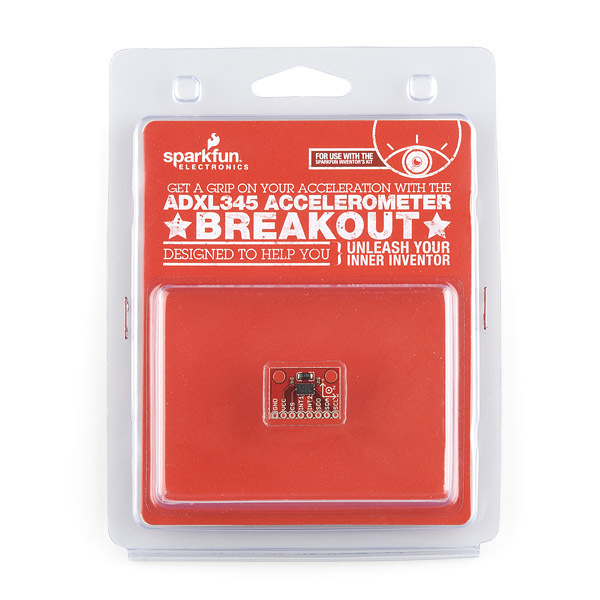 The ADXL345 is a small, thin, low power, 3-axis MEMS accelerometer with high resolution (13-bit) measurement at up to ±16 g. Digital output data is formatted as 16-bit twos complement and is accessible through either a SPI (3- or 4-wire) or I2C digital interface. 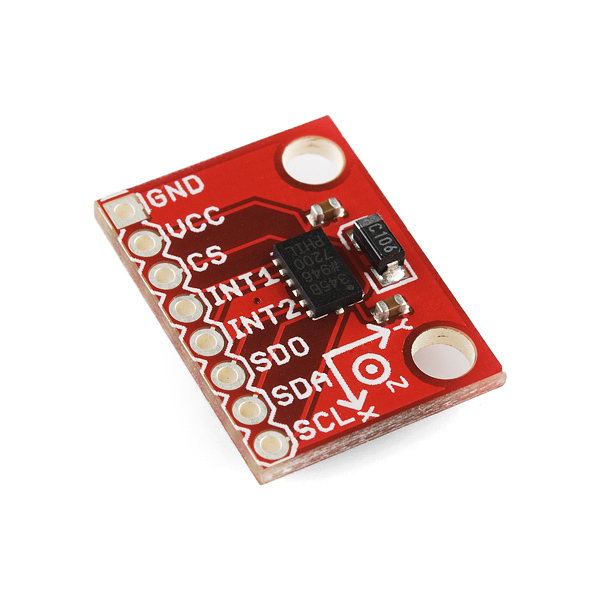 Note: The package incorrectly advises that this sensor works at 3.3-5 VDC. The correct voltage range for this board is 2.0-3.6 VDC. Any one tried free fall detection using SPI? Updated arduino sketch files please for mega2560R3? Otherwise the documents are pointless for people buying these products.. The Bildr tutorial has the updated code for Arduino 1.0, which should work with the Mega2560R3. Just be sure to wire to the correct pins on the Mega, which are located in different spots than on the Uno shown in the tutorial. 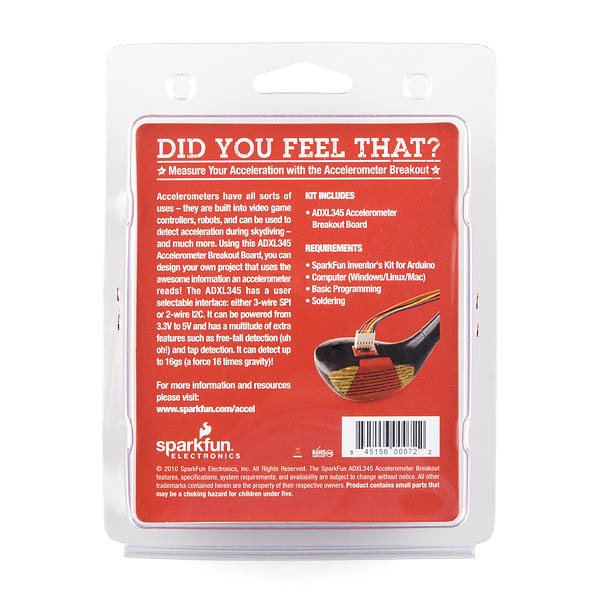 Just wanted to pass on a note of warning with the packaging of this part. On the back of the package (at least the one I received ) it states "It can be powered from 3.3V to 5V and has a multitude...." This is wrong, as the data sheet clearly states that the part has an operating range of 2V - 3.6V. Yeah, same thing on a retail package I picked up.